For many people with diabetes — especially those who use insulin — sticking to a routine is very important to blood glucose control. This can mean eating meals at about the same time each day, and even choosing from a limited selection of foods so that the body’s response to a meal will be more predictable. So it’s no surprise that long-distance travel — especially flying — presents a challenge to many people who use insulin. This challenge was made clear in a recent survey, presented earlier this month at the American Diabetes Association’s 76th Scientific Sessions in New Orleans. For the survey, 503 adults with Type 1 diabetes who belonged to the online community Glu were asked 45 questions about their travel experiences. Among these participants, 70% were men, and the average age was 44. While 71% of participants reported having flown “long-haul” — across multiple time zones — in the last five years, these flights tended to bring a number of hassles. 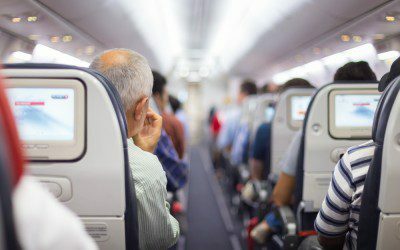 The survey also found that traveling with insulin pumps was difficult, due to both the devices themselves and the security screening associated with flying. One in 10 participants believed that their pump worked less reliably during a flight, and pump users reported more problems getting through security than those who don’t wear pumps (overall, 44% of participants reported problems going through security). Even though some pump manufacturers recommend removing a pump before going through airport security — not a task that many people find pleasant — 42% of pump users reported wearing their devices in airport body scanners. How does this survey compare with your experiences — have you had problems related to your diabetes while flying or on a trip away from home? If you wear a pump or carry insulin with you, do you sometimes experience hassles when going through security as a result? Have you ever had an unusual episode of high or low blood glucose while traveling, or run out of insulin on a trip? What, if anything, can or should be done to make travel for people with diabetes easier? Leave a comment below!